Purchases, purchase credits and bank payments will all report purchase taxes. Sales, sales credits and bank receipts will all report sales taxes. Note that the value used on the order may be that calculated by Brightpearl, or that from the sales channel. Please refer to your developer or channel documentation. When an order is manually entered the tax code assigned to the order row will be the product tax code. If the customer has been assigned a specific tax code this will be used, overriding the product tax code. Brightpearl will automatically post the accounting for VAT for all transactions. The accounting for tax is the same for all VAT schemes. If you are on the FRV scheme then an additional and manual accounting correction will need to be made to periodically, which will make the adjustments for your reduced VAT rate. All sales type transactions with VAT will be posted to this code, these are journal types SI, SC, BR. All purchase type transactions with VAT will be posted to this code, these are journal types PI, PC, BP. This code will be used when the VAT return is marked as reconciled and the 2200 and 2201 are cleared down for the period, it uses a JJ type journal. Note that Sales Receipts (SR), Purchase Payments (PP) and Bank Transfers (BT) are always assigned tax code T9 Not Rated and therefore will not record any VAT amounts or show on the VAT return unless the journals are manually edited. The VAT return in Brightpearl is built by reading accounts journals. The VAT return boxes affected by transactions depends on the nominal code and the tax code used in the journal. Go to Accounting > VAT Return. Select dates as shown on your paper VAT Return. Choose whether to include reconciled transactions in the current period. Transactions that have already been reconciled for VAT using the VAT Return page. The normal setting for this option should be no. Choose whether to include unreconciled transactions prior to the chosen period. The normal setting for this option should be yes. This will include transactions with a date during any previous VAT period that have been entered into your accounts since the last VAT report was produced. Choose whether to display a detailed report. Click Submit to show you VAT return figures. Copy the numbers to your paper VAT Return. If you are using FRV you will need to convert the figures to your flat rate and post and adjusting journal. It's a good idea to display and print a copy of the detailed report for your records before you reconcile the VAT transactions. Click the Reconcile VAT Return button to mark all the included transactions as reconciled for the tax period. Marking the VAT return as reconciled will post a JJ type accounting journal to clear down the 2200 Sales Tax Control account and 2201 Purchase Tax Control account and increase 2202 VAT Liability account with the amount owed to the HMRC for the tax period. If you are required to report tax in more countries than the UK you will need separate tax codes for each reporting scheme. To ensure tax codes and transactions relating to tax payable outside of the UK VAT use Tax Regimes. A tax regime is a category of tax code. The VAT return will include only tax codes assigned to the "VAT" tax regime. You can create as many tax regimes as you need to separate tax codes into reporting groups. When you are happy with the numbers that display on your VAT Return, print 2 copies then click the Reconcile VAT return button. A journal will be created to transfer the VAT payable from your sales and purchase tax nominal codes into your VAT liability account. This will mark each transaction included in the return as reconciled. Once a transaction has been reconciled for VAT you will not be able to change it. It is good practice to ensure that all Brightpearl bank records have been reconciled with the bank statements for the VAT period first to reduce the chance of errors. If you owe money to HMRC use a bank payment to record the payment from your bank account, posting it directly to the VAT liability account. The amount paid should be the balance of the VAT liability account leaving an overall balance of zero after the payment has been processed. If you are receiving money from HMRC use a bank receipt to record the payment into your bank account, posting it directly to the VAT liability account. The amount received should be the same as the balance of the VAT liability account, leaving the overall balance as zero after the payment have been processed. To check the balance of the VAT liability account, view the Trial Balance. You can view the transactions that have been included on previous returns by opening Reports > More > VAT History from the main menu. Running a VAT return for the same dates as a previously reconciled VAT return will not provide a historical VAT return view. Each time the VAT return is run it produces results based on current data so any new transactions added since the VAT reconciliation will be included too. Why is my VAT return incorrect? You are responsible for ensuring that all of your VAT returns are submitted correctly. If you suspect there is an error, then it is recommended to review all journals included in that return via Reports > VAT return history. You should also seek advice from your Accountant. Only sales (4000-4999), purchase (5000-5999) and tax control accounts (2200 & 2201) will be included in the VAT return. Excludes postings to purchase nominal codes (5000-5999). Excludes postings to sales nominal codes (4000-4999). JJ journals were previously not included in the VAT return. Due to changes in version 4.60 JJ journals created on or after 1st January 2014 will now be included, and any JJ journals dated prior to this will be excluded. Journal types SR and PP are always excluded from the VAT return. Transactions made using these journal types would not normally be assigned tax codes. For a sales nominal code (4000-4999) the full amount is included in Box 6 of the VAT return. A credit will increase box 6 and a debit will decrease box 6 (Sales). For the sales tax control account (2200) the full amount is included in Box 1 of the VAT return. A credit will increase box 1 and a debit will decrease box 1 (Sales tax). For any nominal code which is not sales (i.e. 1-3999 and 5000-9999) the full amount is included in Box 7. A debit will increase box 7 and a credit will decrease box 7 (Purchases). For the purchases tax control account (2201) the full amount is included in Box 4 of the VAT return. A debit will increase box 4 and a credit will decrease box 4 (Purchase tax). Prior to version 4.60 JJ journals were always excluded from the VAT return, even where the journal rows were assigned tax codes. JJ journals are generally system created journals where tax was not applicable. However, where a manual journal was entered this would also be excluded and made it more difficult to manually enter journals which should affect the VAT return. As of version 4.60 we introduced changes to begin including JJ journals on the VAT return. Since JJ journals had never been included they were never marked as VAT reconciled, and this meant that the VAT return could potentially now include old JJ journals since the date you began using Brightpearl. In order to prevent this, part of the transition to including JJ journals was to mark old JJ journals (dated before 1st January 2014) as reconciled. I thought JJ journals were always included, does that mean my past VAT returns were wrong? Most JJ journals are system created and tax is not applicable - they are always assigned the "T9 Not rated" tax code. 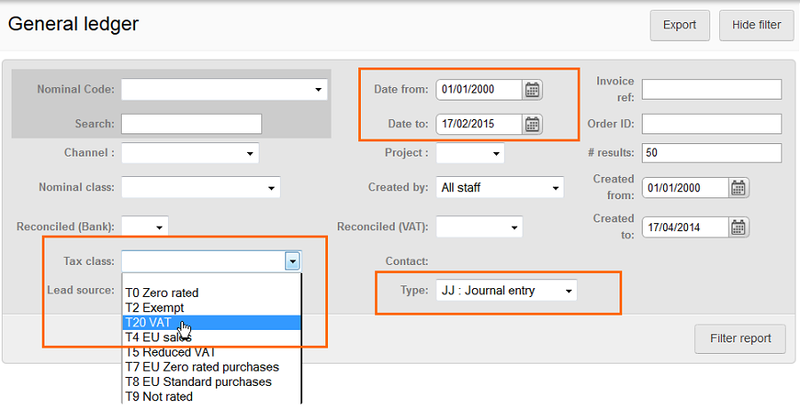 The filters on the General Ledger report can be used to identify JJ journals with tax codes, this will allow you to identify journals and investigate whether those transactions should have been included in a past VAT return. What does this mean for reconciled VAT returns? Reconciled VAT returns are not affected by these changes. However, if you choose to remove a VAT return which was reconciled before these changes of version 4.60 and that VAT return covers dates within 2014 and JJ journals with tax codes (other than T9) exist, then a different result would be given even if no additional activity was recorded. Obtaining a list off JJ journals with tax codes using the filters on the General Ledger report will allow you to identify those journals which will now be included. How do I identify those JJ journals? The filters on the General Ledger report allow you to identify journals by type, date range and tax code. Go to Reports > General Ledger and search for JJ journals for your VAT return period and then search by one tax code at a time to identify those JJ journals using a tax code which would cause it to display on your VAT return (i.e. a code which is not T9 Not rated). How do I make sure those journals are not included? Using the process above you can identify those journals. Open to edit the journal and change the row tax codes to "T9 Not rated". This will exclude the values from the VAT return. I don't want JJ journals prior to 1st January 2014 automatically reconciled. Can you undo this? Yes, if you wish to include JJ journals made prior to 1st January 2014 on your next VAT return we can remove the "reconciled" flag. Please contact our Support team to request this is done. Only where a payment is allocated against the invoice. All JJ, SR and PP type journals will be excluded even if a tax code has been assigned to the journal row. The VAT return boxes 8 and 9 will include all sales and purchases which use the tax codes T4, T7 and T8. Box 2 will display tax on EC purchases (purchases using tax code T8) using the rate from the company default tax code chosen at Settings > Company > Accounting: Tax. Use the EC sales list to produce a report for the Inland revenue. Click Reports > Accounts...More > EC Sales list. Brightpearl does not support Flat rate VAT accounting - tax will be accounted for in full. If you choose to use Brightpearl when registered for flat rate VAT manual adjustments will need to be made to account for the differences. We highly recommend you seek accounting advice on how the journal should be entered and for what value.